What should “A Reader” attempt to do? One looks for it to provide an overview of an author’s work. The reader is a book that should be suitable for the classroom and instruction. It should be a quick readable guide into the work of a difficult writer. Finally, the reader is the reference book, the document that one places inside showcases. 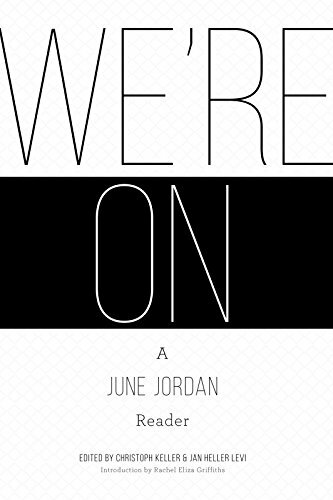 For all these reasons one should celebrate the publication of We’re On: A June Jordan Reader. This book is a reminder that African American literature didn’t begin with Toni Morrison or end with Phillis Wheatley, or maybe it’s the other way around. During her lifetime, June Jordan was not overlooked. She was too prolific for that; hence the editors Keller and Levi had more than enough work to select from. June Jordan was fierce, passionate, and political. She was also a visionary. It is not ironic that the first entry in We’re On is an essay about her collaboration with R. Buckminster Fuller and their plans to “recreate” Harlem after the riot of 1964. We’re On will probably introduce Jordan’s work to a new generation of activists. What they will discover is that she was more than a poet. To some extent her essays and interviews in this collection overshadow her poetry. They reveal her intellect and thinking on issues ranging from Black English to what we make define as the state of the union. But read the poems in this book because they will underscore June Jordan’s international perspective and concern especially when it comes to the Palestinian struggle or African liberation. In her introduction Rachel Eliza Griffiths describes June Jordan as a midwife and mother. This description finds Griffith being personal but it could be misleading to historians. Was Amiri Baraka really the “father” of the Black Arts Movement? June Jordan lived a committed life not a complicated one. She was revolutionary if we dare use that term today. Read this reader, maybe beginning with Jordan’s “Poem about My Rights” or “Poem About Police Violence.” If nothing else June Jordan will teach you how to love, no matter who you are. This book is the rainbow sign after all the flooding across America. E. Ethelbert Miller is the author of books of poetry and memoirs, most recently The Collected Poems of E. Ethelbert Miller. He was Director of the African American Resource Center at Howard University and has received honorary doctorates in Literature from Emory and Henry College.